Christmas and New Year when you can also enjoy the additional Christmas lights that are up around the city on peoples homes and shops. Try to avoid very cold or very wet evenings due to the windows fogging up and restricting the view. 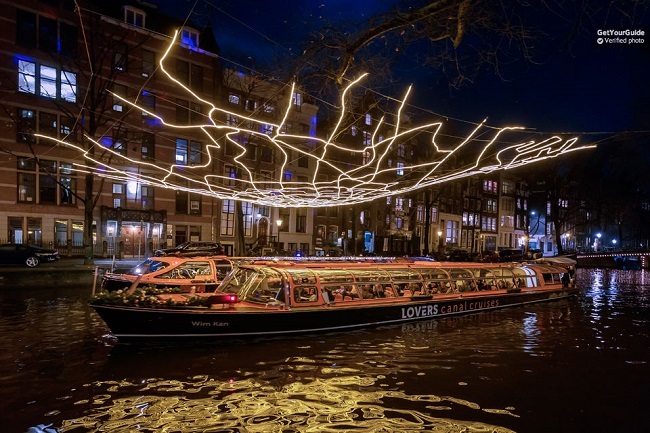 We are comparing Amsterdam Light Festival Canal Cruise Prices from leading ticket suppliers and Try to find you Cheap tickets prices on the market. Amsterdam\'s Annual Light Festival brings the city to life with unique light sculptures, and light projections from national and international contemporary artists. Many sculptures line the banks of the canals, cross over the water above the boats roof, adorn the bridges, and float on the water itself in a magical display of colour and light that cannot be admired in the same way on a walking tour or Segway tour. In 2017-2018 30 sculptures were selected from over 300 entries to liven up the dark winter nights of the city. Some of the light displays use cutting-edge technologies while others take a simpler yet equally beautiful approach. A must-see if you\'re in Amsterdam between 30th November - 21st January and want to see the city lit up at night. A fun and festive tour that\'s family friendly. the ideal way to get in the festive spirit if visiting before or during the Christmas holidays! Your Experience With Amsterdam Light Festival Canal Cruise? Board the barge for a magical and relaxing cruise along Amsterdam\'s picturesque canals that are even more stunning than usual. With audio commentary in English and Dutch not only will you be able to learn about the stunning and beautiful light installations that line the banks, cross over the river, and adorn the bridges, but you\'ll also get to see and learn about other top historic sights and attractions in Amsterdam. this is a boat trip that will leave you feeling like a little kid and certainly help you get in the festive spirit, have those camera and phone batteries fully charged as you\'ll be taking a lot of photos and videos of the lights that you pass! What Amsterdam Light Festival Canal Cruise Includes? Pass by some of Amsterdam\'s top historic attractions too. Stand at the back of the boat for the best view. If given the option, choose the open boat – It\'s colder but there\'s no chance of fogged up windows restricting your view. Travelers Reviews about Amsterdam Light Festival Canal Cruise? Travellers talking about this on GetYourGuide, Viator, and TripAdvisor give it good reviews for the most part. Some people were less than impressed by the lights having seen better displays in other countries but these points of view were limited in number, other people had problems with fogged-up windows and commentary that wasn\'t translated into English. As is always the case, it\'s about managing expectations – Most people were truly thrilled with this boat trip and thought the lights beautiful and magical and the ticket price very reasonable agreeing that it was a fun thing to do, a delight for the kids, and got them in the festive mood. Printed vouchers must be presented, e-tickets not accepted. Make sure you have printed your confirmation voucher – E-vouchers not accepted on the boats or at the ticket office. Kids under 3 go free but they must sit on your lap.